Anytime you open a NBA Game on a 14-0 your first concern is damage control an opposing team , that is exactly what the Bulls had to do, except the Wizards had other things on ther mind that included doing more damage in the absence of NENE tonight in Game 4. The early damage killed the Bulls and lack of a fluid offense at any given time cost the Bulls any chance to come back in this game. Trevor Ariza had a career playoff-high 30 points, and the Wizards scored the first 14 points of the game and barely looked back Sunday, overcoming the absence of their so-called “X-factor” as they beat the Chicago Bulls 98-89 to take 3-1 lead in their Eastern Conference series. Washington’s 14-0 lead to start the game was one of the best of the season, so much that Bulls coach Tom Thibodeau called a timeout after each run. Chicago’s first seven possessions consisted of six missed shots and two turnovers. Jimmy Butler finally got the visitors on the board with an 18-footer 4:12 into the game. “It was huge for us. I think it all started yesterday because we had all had a lot of focus coming into the game. We eventually found out Nene wasn’t playing and it kinda sparked a little bit more fire up under us to be able to come out and get this game. I know a lot of people probably doubted us. We did a great job coming out and focusing in. It started with our defense like John said. Once we got out to that 14-0 run at the beginning of the game, we just took off from there. Yeah, they went on that run, but I think we did a great job of staying poised the rest of the game. 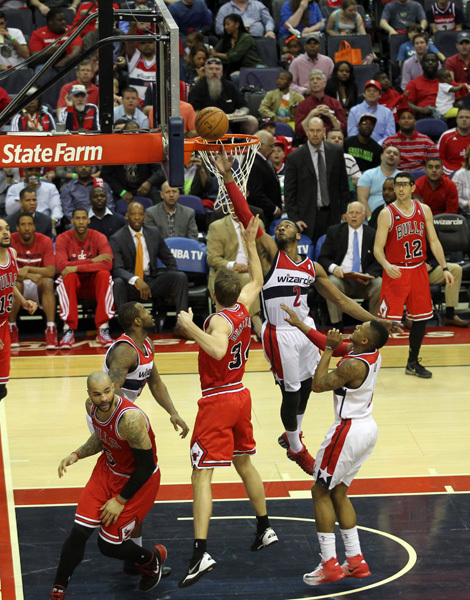 Our defense is what definitely won us the game,” said Wizards Guard Bradley Beal. One of the biggest statements of the night came from Wizards owner Ted Leonsis, who wore the Nene Jersey for the game and his emotion was huge the entire night. Ariza’s six 3-pointers tied a Wizards playoff record. Bulls Forward Carlos Boozer committed five fouls — all in the third quarter which limited his action. Taj Gibson is the first Bulls player with at least 30 points and 5 rebounds off the bench in a playoff game (since starters and subs were first tracked in 1970).